A few weeks ago I was browsing Instagram when I spotted several of my fellow Houston bloggers all posting from the same place. 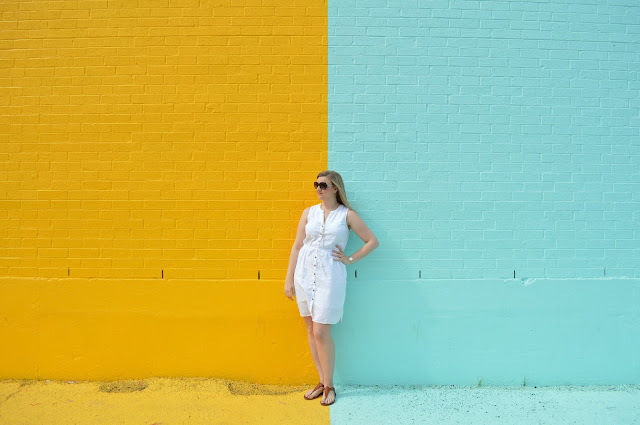 They were posting from a gorgeous wall of color, right here in Houston. My first thought was: "WHAT! I've never seen that wall. How in the world did Ashley and I miss that on our mural day back in March." My second though was, "I NEED TO GO THERE!" They all had tagged the following hashtag: #sugarandclothcolorwall. I clicked the hashtag and it took me a ton of other pictures in front of the wall and eventually to the Sugar & Cloth Instagram page! If you haven't seen it, they basically have one of the prettiest and most colorful Instagram pages ever. 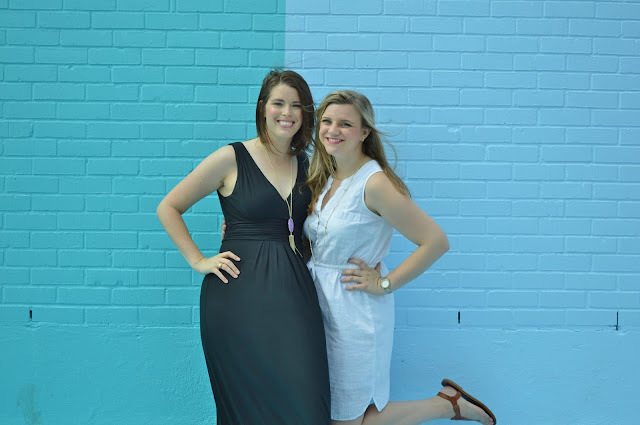 I originally met Ashley from Sugar & Cloth at the Thrive Blog Con. She talked to us about increasing our social media presence and was an absolute doll and so knowledgeable. She's also just about the best DIY-er I've come across. So when I heard that her business was the sponsor of the wall I knew it was gonna be good. So obviously, Ashley from The Wandering Weekenders (aka my blogging buddy and Houston explorer partner in crime) and I had to check it out. The wall is located at 3302 Canal Street, Houston TX 77003. It's on the wall of the building that is going to be the future home of a company called, Headquarters. There is plenty of parking directly in front of the wall and the is a ton of space to allow for plenty of people to share the space without getting in each others way. There were a few other people already at the wall by the time that we got there (around 10:20 in the AM). But we all worked around each other and it worked perfectly. Ashley and I took turns taking some photos in different parts of the wall. And we used her tripod to catch some photos of us together. We both wore neutral colors because we felt those would stand out the best with such bright colors as our backgrounds. I can't decide which color combos I like the most! They all go together so well! SO...here are a handful of the pictures we snapped! We were able to snag the wall all to ourselves for about 5 minutes. 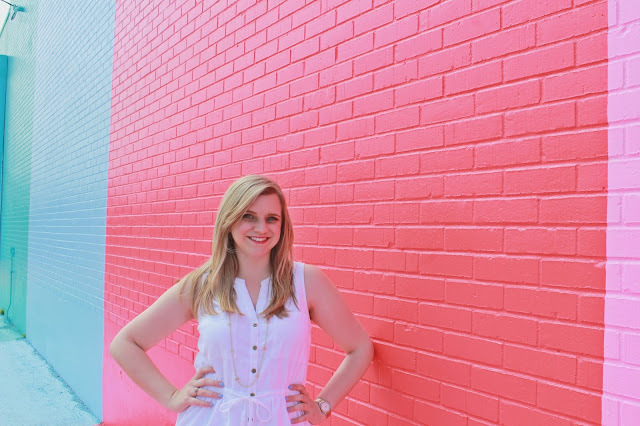 Which was awesome because we were able to get more of the wall in our pictures by going across the street! 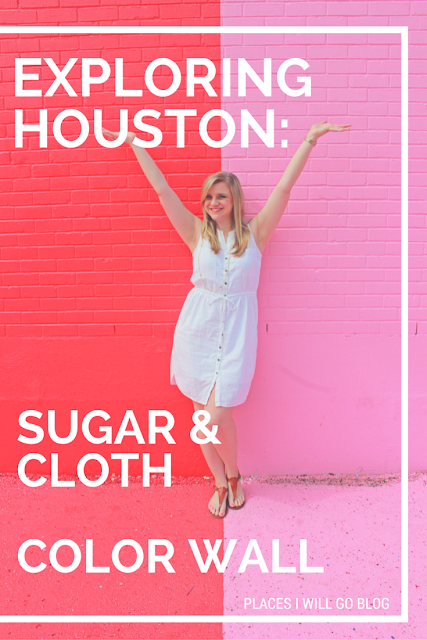 If you live in Houston or are planning to visit I 100% suggest you make a stop at the Sugar & Cloth Color Wall. 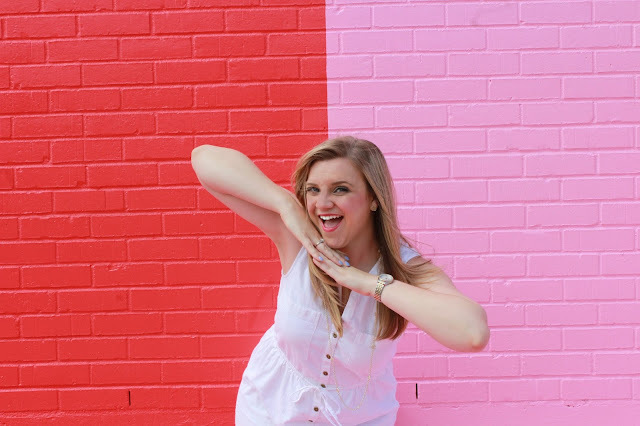 You will have so much fun posing in front of the wall (bring some props if you want!) and will come away with some really fun and colorful pictures! Just as a reminder you can find the wall at: 3302 Canal Street, Houston TX 77003. That's so pretty! I love the yellow and blue combo! Love love love that we got to visit together! I keep on telling people that I'm already trying to figure out when I can go back and take more pictures! 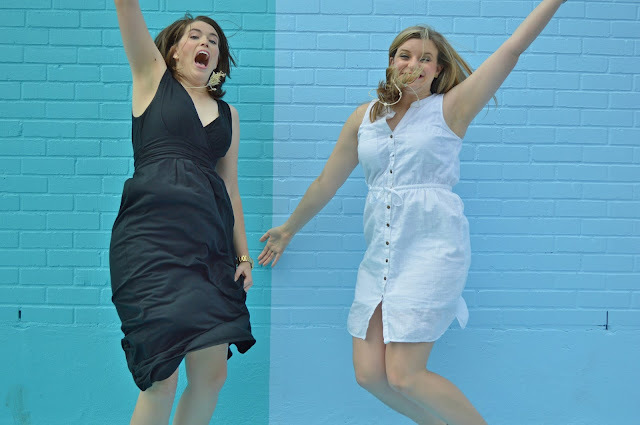 I think that might be where we need take some blogiversary pictures like you suggested! ugh i so want to go there! love it. so pretty. and i also love your sandals! This looks like such a fun spot! Will definitely have to make my way here after I move, maybe if you and Ashley are planning another trip down there after I've moved to Houston we can go :)! Is it by a pretty busy street or not much, looks kind of industrial? That jumping pic is a great blooper pic lol! This is so cool! I see people posting pictures of awesome walls in Los Angeles all the time. I saw a guide to Instagram walls in LA the other day. Honestly, I have to follow that guide and find my own gold. 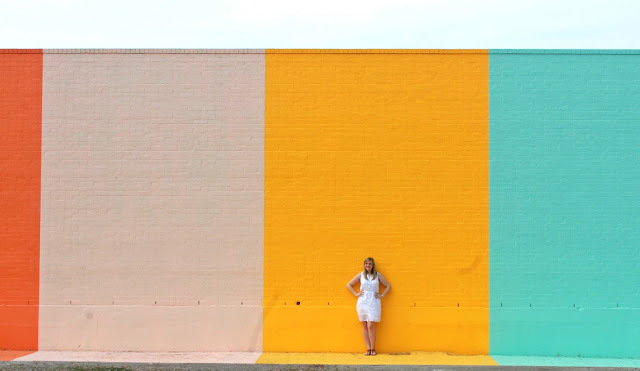 It looks like a fun place to have a photoshoot, I've seen a few post about Houston's colored walls, but this one is the coolest! How FUN! I love how you turned that photo into your title picture for the post. Great photos of, and with, the wall! 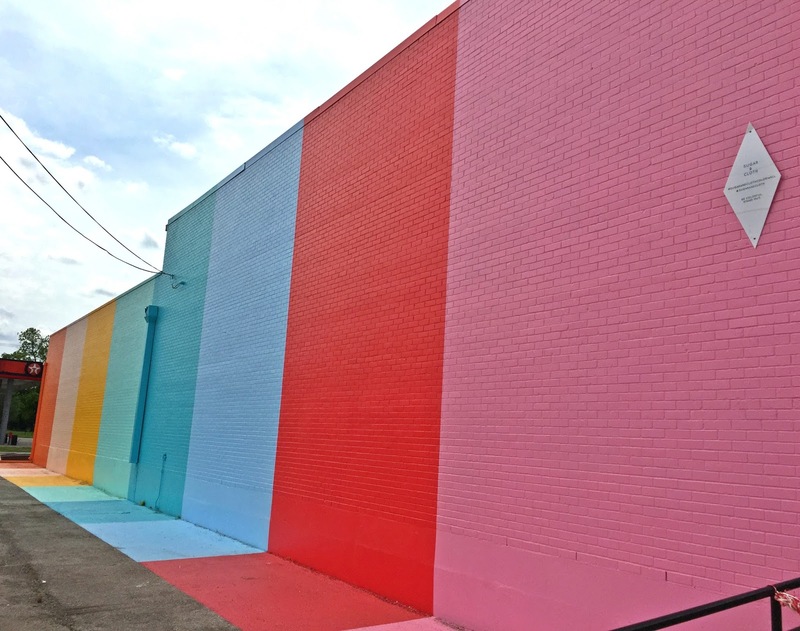 It's definitely a nice addition to Houston's art/mural scene, and a great way to perk up the neighborhood. How fun! I still haven't made it out there but I really want to! 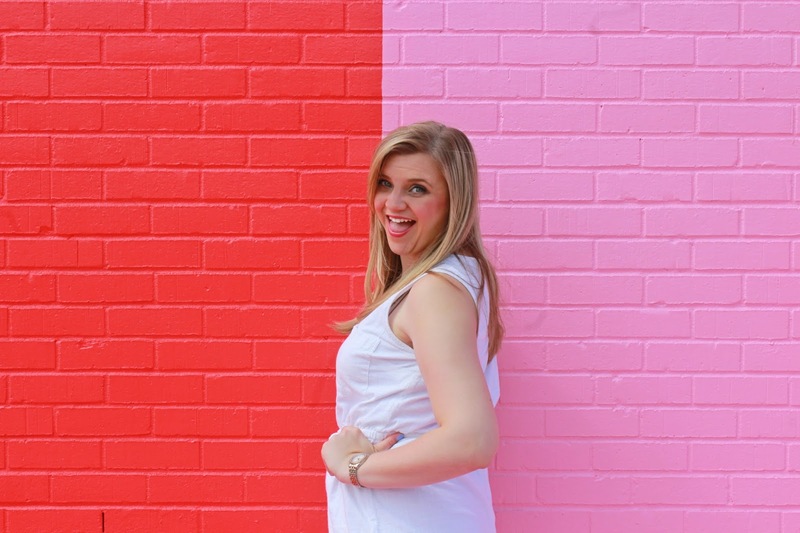 I'm obsessed with this wall!! I love your fun photos in front of it. Looks like you had a great time! Love this! 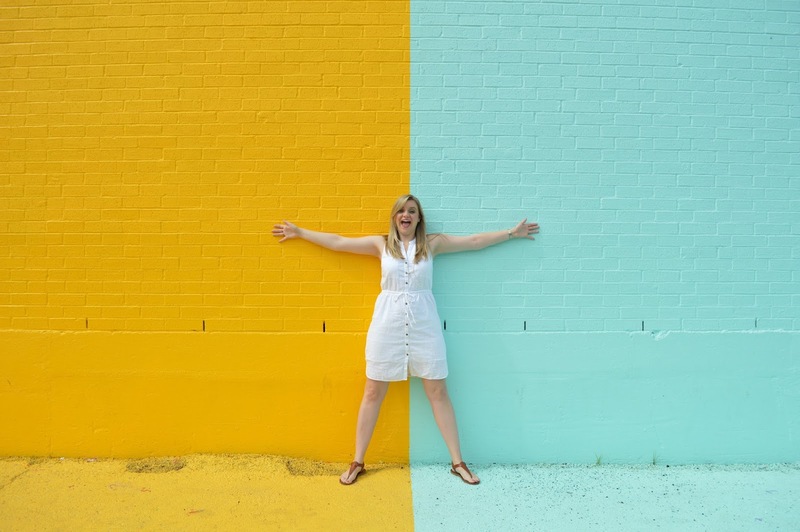 I also saw some photos of the color wall on Instagram, but have yet to visit in person. Looks like fun! 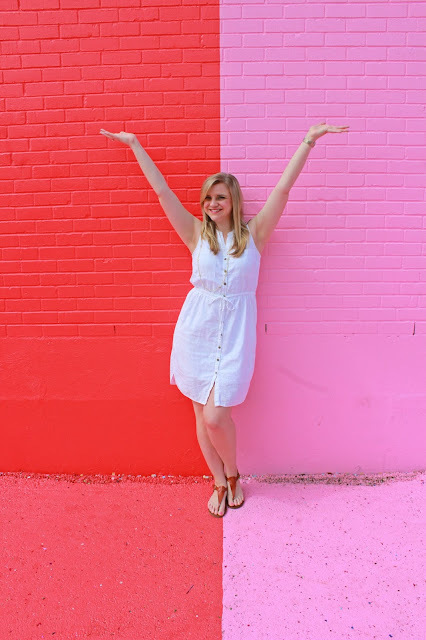 Def one ofmy fave photo spots in Houston! I haven't visited this famous wall yet, but I need to! I keep seeing all of these wonderful pics there. LOVE this wall!! I must make a visit soon! Your pics are so cute! I love that wall so much!! Sugar & Cloth did such a great job! How cute! I love seeing people take photos at the color wall! That wall is seriously a blogger's dream come true!! LOL! Love your pics, girl!! 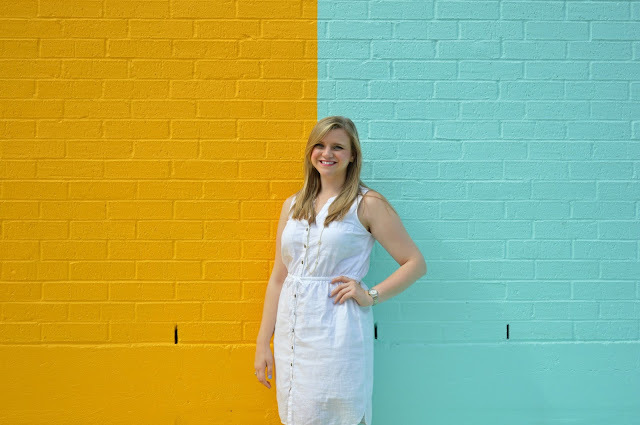 Isn't the color wall so amazing!? I'm obsessed! OMG I need a wall like this near me! How pretty and colourful!